As I have discussed in previous posts, I was in Scottsdale last week for a conference which was fun. I really liked Scottsdale, especially in October because it was 85 degrees during the day and 70 at night. I am definitely someone who would rather be hot than cold so I always enjoy visiting Arizona when I can but the one time I went when it was 115 degrees and Gary made us talk with a Store Manager in a restaurant parking lot was a little intense (we’ll never let you live that one down Gary). Scottsdale has a ton of money, I was driving around and found a Ferrari/Maserati dealership which I had never seen before. On my way to my fancy smancy McDonalds lunch I was driving through a golf course community and saw a Ferrari go past me. I saw two Bentleys driving down the road and the final day I was there I went to Starbucks before going to the airport and a lady parked her Aston Martin literally in the middle of the road in front of the building. I also love all of the cactus all over the place and I guess they tend to grow pretty slow from what others were telling me. I lived in Reno, NV for three years which is considered high desert and I always thought it had its own sense of beauty. 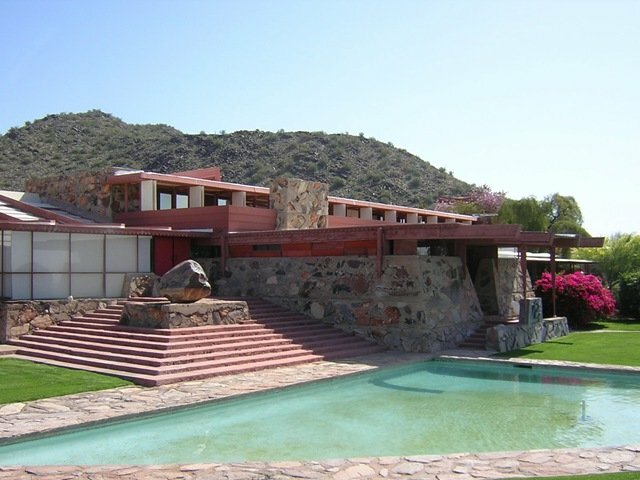 The last night I was there they had the President’s Dinner at Taliesin West (photo above) which is one of Frank Lloyd Wright’s homes and is where his foundation is located today. I had obviously heard of Frank Lloyd Wright but I didn’t really know anything about him prior to going to the event. We got a private tour of his residence and the tour guide was really nice as she let us take our wine in and literally sit on anything we wanted and make ourselves at home. The dinner that night was in his theater and I can’t verify what the guide told us but she said Wright was an innovator who never patented any of his works or ideas. She said he came up with the idea of surround sound via stone walls which were not 90 degrees and theater seating which was evident in the theater. I’m sure he came up with other innovations but those were just two things he was able to incorporate into his Taliesin West home. If you ever get the opportunity to visit I really found it interesting and I’m not usually into architecture.